The enemy fired 60 mines and 14 projectiles on ATO positions near Mariupol. 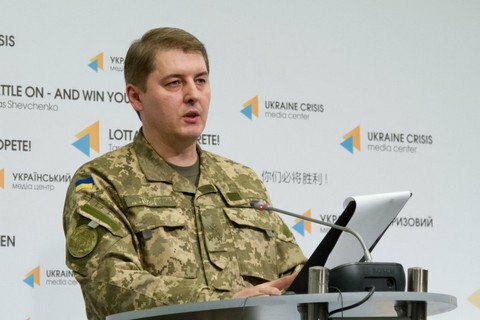 One Ukrainian soldier has been killed and another wounded in Donbas in the past day, Defense Ministry press officer Oleksandr Motuzianyk told press briefing in Kyiv on Thursday, 17 November. The militant forces were conducting strikes mainly in the Popasna district of the Luhansk region between 8:00 p.m. and 10:00 p.m., using heavy weapons, he said. Two provocations were also recorded east of Stanytsia Luhanska, near the Ukrainian-Russian border. All in all, eight ceasefire breaches, half of them involving the use of heavy weapons, have been registered in the Luhansk region in the past 24 hours. Two instances of lengthy shelling were reported in the Avdiyivka industrial zone in the Donetsk region, with militant units using mortars and armored hardware, Motuzianyk said. One instance of shelling occurred in Luhanske, Dokuchayivsk and Opytne each. All in all, eight strikes have been recorded in the Donetsk region in the past 24 hours, including three strikes with the use of heavy weapons. "The adversary fired 60 mines and 14 projectiles on Ukrainian military positions near the city of Mariupol, and also shelled Maryinka and Dokuchayivsk. The Ukrainian military had to return fire," Motuzianyk said. A total of 24 strikes, seven of them involving heavy weapons, have been recorded near the city of Mariupol in the past 24 hours.